God Bless America! 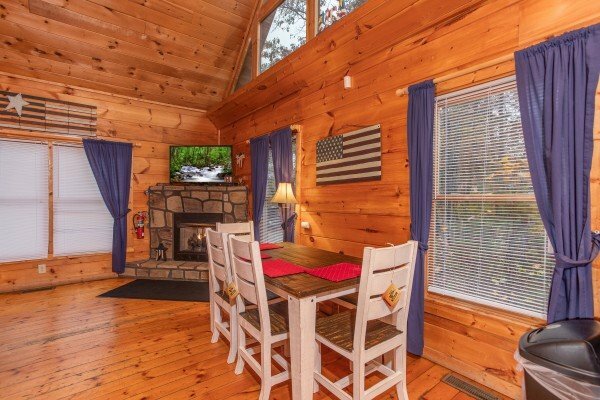 The Patriot Inn is a beautiful one bedroom two bath cabin in the heart of the Great Smoky Mountains. 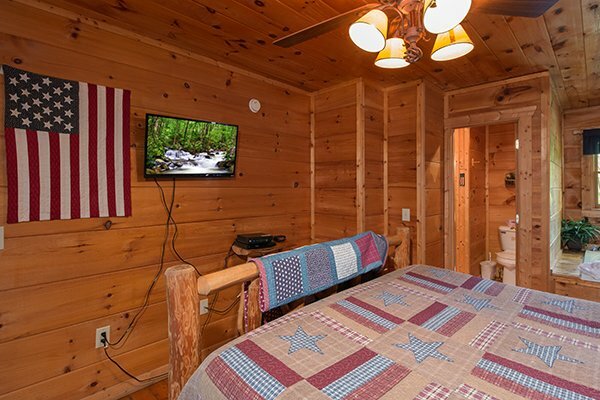 Decorated in a very Patriotic Americana theme, this cabin has it all and more, with a fully equipped kitchen, satellite TV, VCR, DVD Player, Large Jacuzzi tub in the Master bedroom with a Custom King size Log Bed, lofted bedroom with a custom Queen size Log Bed, two living areas one with a Gas Fireplace and the other with 2 sleeper sofas and a 42" PLASMA FLAT SCREEN TV, a game area with a Pool Table and Dart Board and of course a wonderful hot tub to soak in and enjoy the wonderful wooded mountain views. 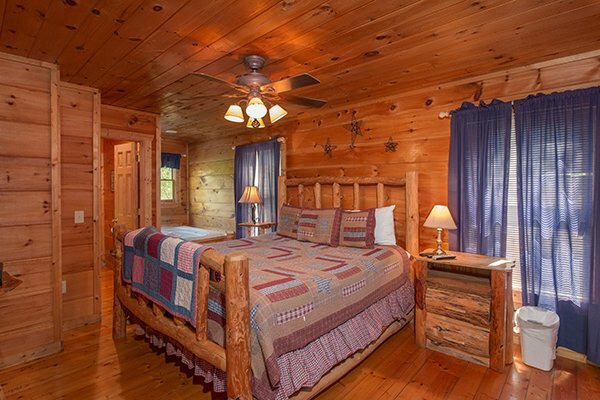 Don't miss your chance to stay in the spacious one bedroom Premium log home. 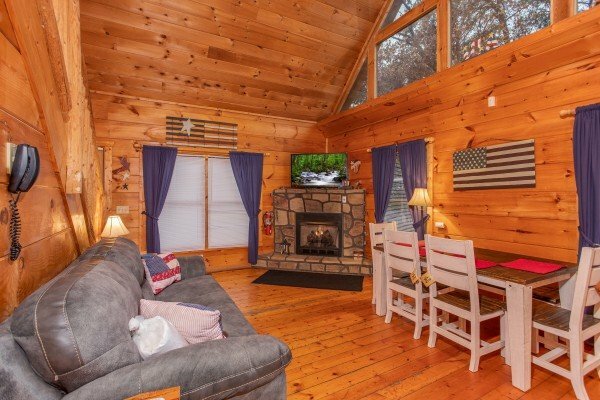 We are extremely pleased that we chose to book our vacation with American Patriot Getaways! The staff (Perry) made our trip stress free! Honestly, I was amazed every step of the way! We had never been on a vacation so far from home. The directions to the cabin were on point. 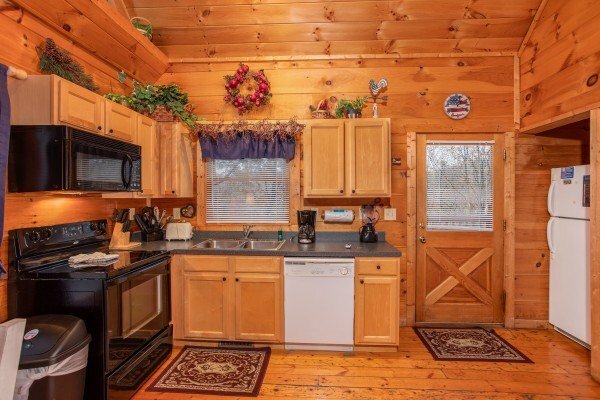 The cabin was beautiful, and clean! Also, equipped with everything we needed for the four days we stayed! It was very peaceful, comfortable, and private. The price was reasonable, and we have no complaints at all! 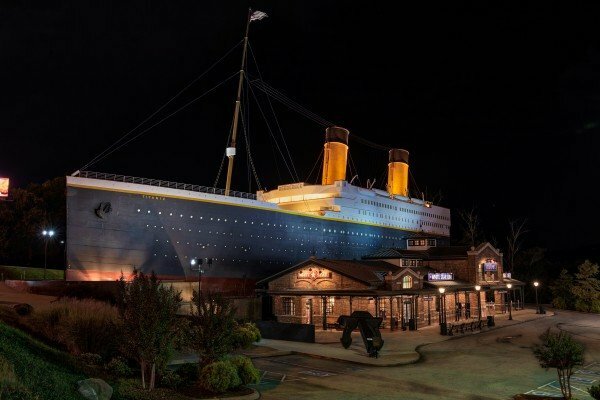 We would definitely stay again, and bring others with us to enjoy all the beauty of the Great Smokey Mountains! Thank you so much! We greatly appreciate the way we could trust, and feel secure so far from home. Oh, and we also brought our 13 year old dog. We couldn't have lefther at home that long. 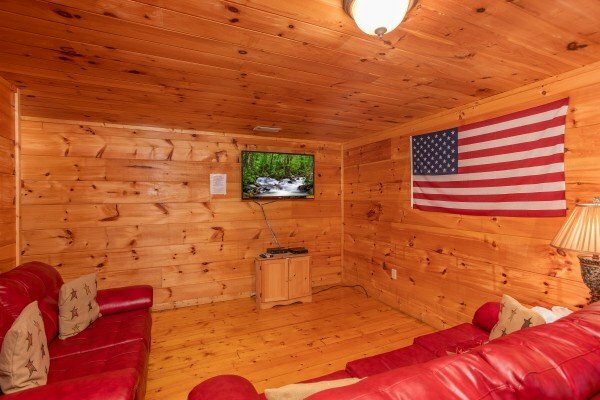 So just another reason we appreciate American Patriot Getaways! 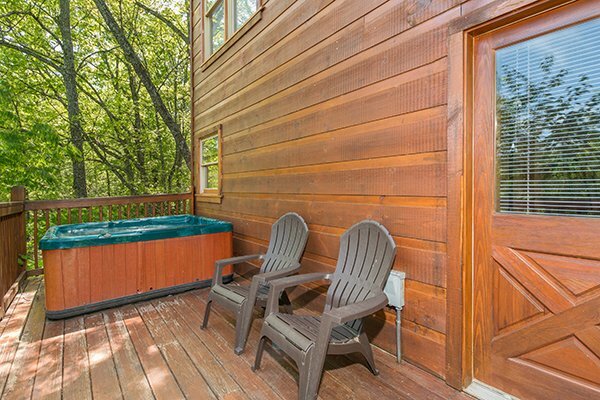 The pictures on the website do not do this property justice. It was absolutely beautiful, everything was clean, and it was close to both pigeon forge and gatlinburg. 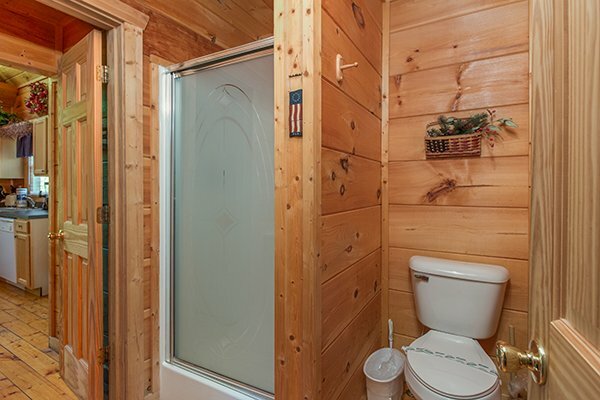 We will definitely reserve this cabin again. 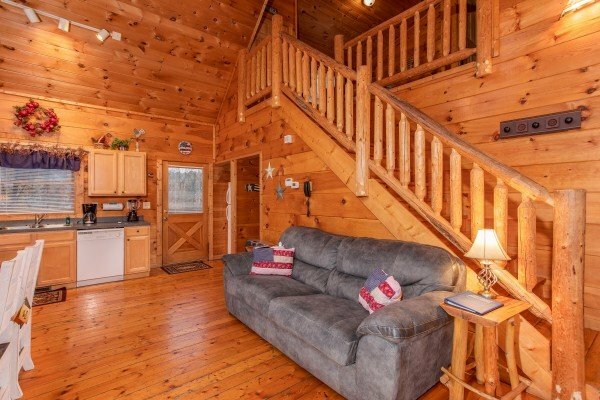 This cabin was absolutely an amazing fit for our family. 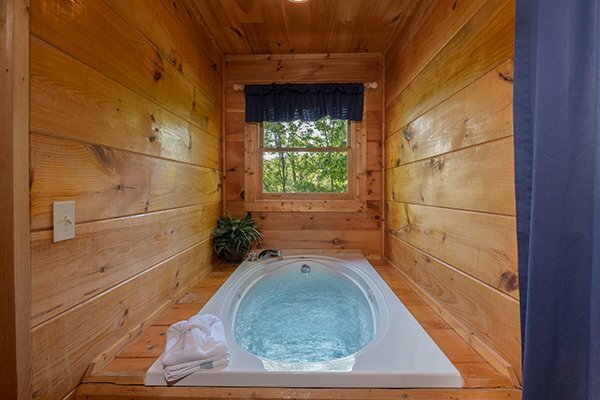 Enough room to hang with family and have some private time on the different levels. Walked out one evening an observed a momma bear and three of her cubs, safely in a tree. Wonderful place to comeback to after a day of sight seeing. Only problem was, we only booked a two night stay. The family wants to come back next year and stay for a week. Check in and check out couldn't have been easier. Great vacation in the beautiful smokies. Thank you for helping my family and I make great memories! We absolutely LOVED our stay! Best part of our vacation! The only negative..wish we would have stayed longer! We will definitely book again! 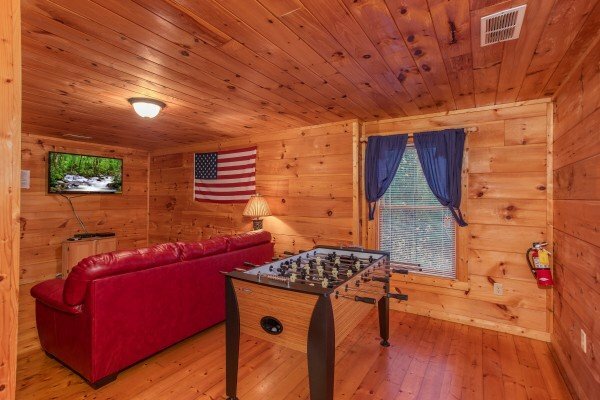 Our kids had so much fun in this cabin! Thank you for a wonderful opportunity and a very comfortable stay! Cabin was beautiful! Enjoyed the stay! We had a great time staying at Patriot Inn. 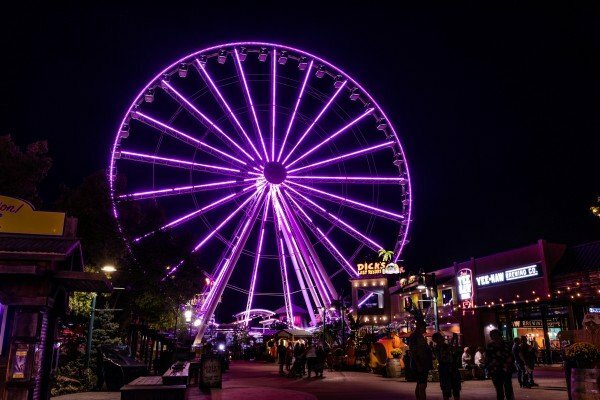 It was great to be between Gatlinburg and Pigeon Forge to easily get to both locations easily. 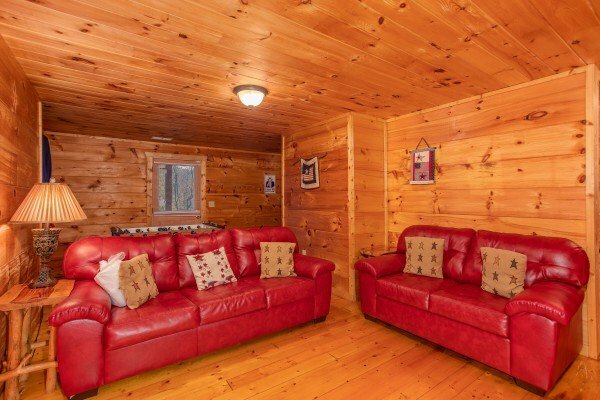 The cabin was a perfect size for our family and all the amenities were great. Please look at the seals around the exterior doors for air gaps. We will definitely be staying here again. Great experience. 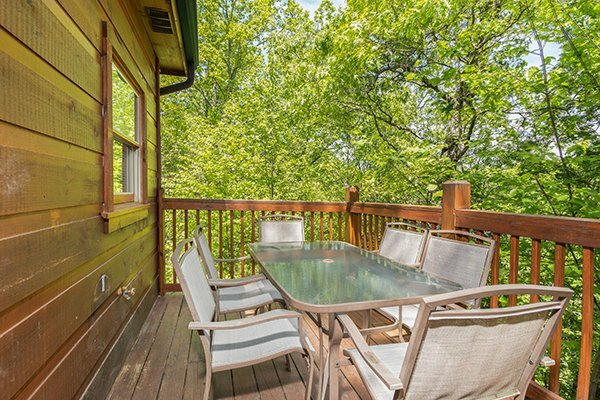 Views were great, easy to find, and cabin was everything described. Our family had an amazing stay at patriot inn. It was clean beautifully decorated just as cozy and comfortable as anyone would want. The lights were on for us as we arrived late in the evening. 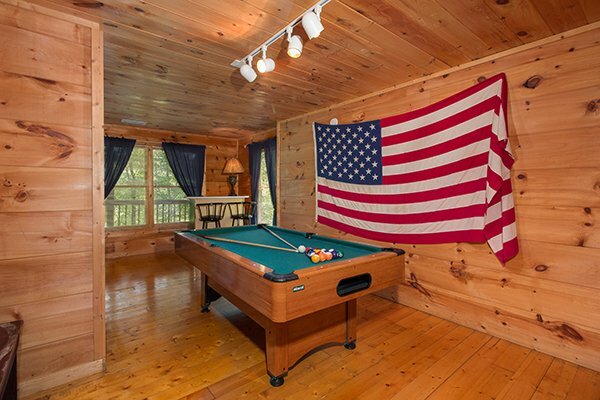 A+ for patriot getaways! Had a great time,cabin was beautiful. Very nice accomadations. Made our trip feel more special than just staying in a hotel. We stayed at the Patriot in for 8 days. 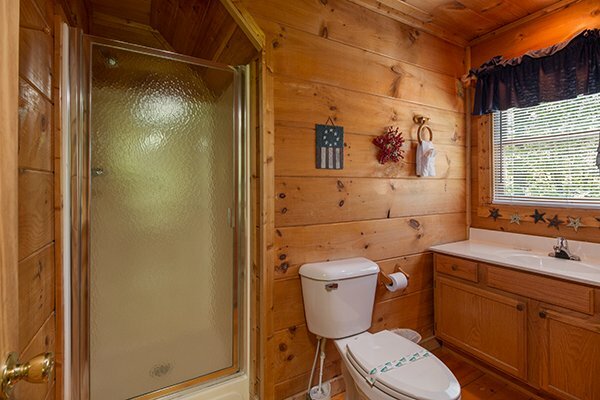 The cabin is beautiful and well equipped. We loved being on top of the mountain too. 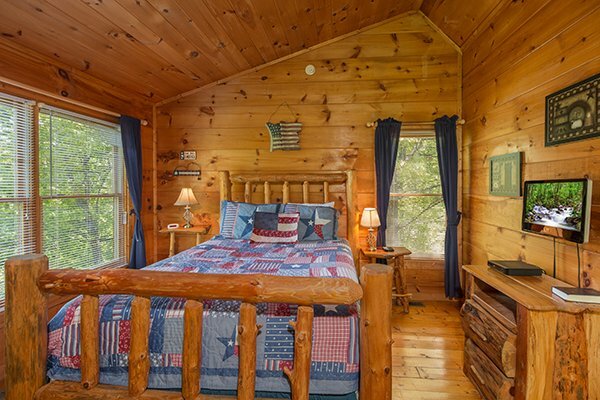 The pictures online do not do this cabin justice. The views are great and it is so quiet and serene. We loved the hot tub, pooltable, and foosball table as well. Lastly, we originally were booked for 6 days. 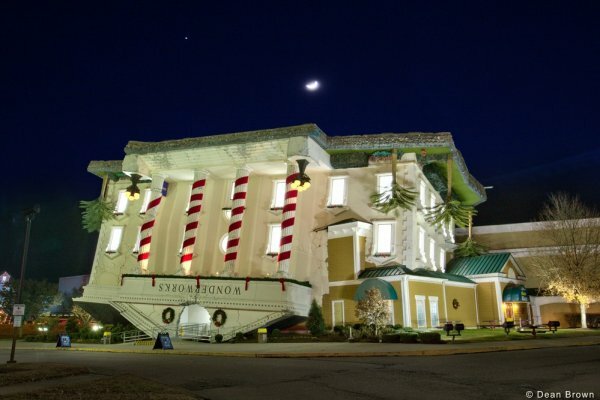 Thanks to American Patriot, we were able to add two days to our stay for a greatly discounted rate! We will definately return and use American Patriot for all our stays. 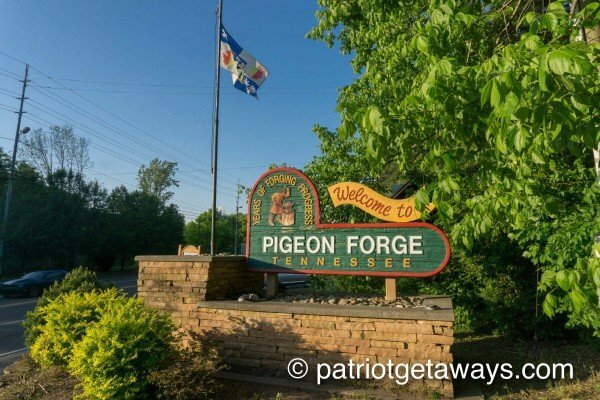 We have been visiting the Pigeon Forge/Gatlinburg area for over 25 years - This was our first time staying in a cabin and we will do this again! 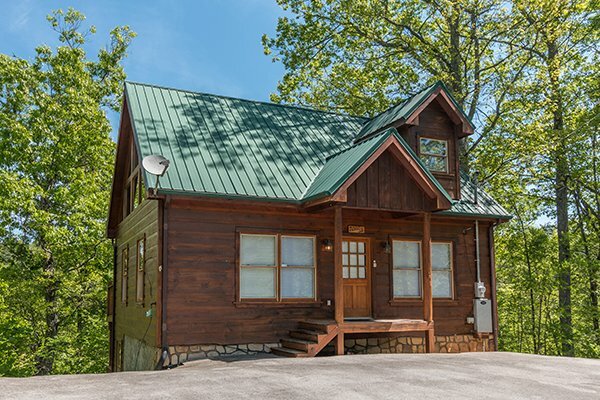 Great location for both Pigeon Forge and Gatlinburg - This cabin provided excellent space for everyone - We arrived at 11:30pm (thank you for leaving lights and music on) - Directions that were provided were excellent (we did not use our GPS as you instructed not to use!) - Loved that we did not have to check in or out with anyone and also just leaving the key inthe keybox - I called to make the reservation and service was outstanding - We always travel with our dogs and we appreciate allowing them to stay as well - We will be doing this again in the near future!! Everything was perfect as we've come to expect from APG. This was our 6th time and we will be back. We did have trouble getting the jets on in the jacuzzi but after calling customer service it was a quick fix by pushing reset button on a nearby outlet. During the call I mentioned that a couple pool table balls were missing mainly so we didn't get charged for them but replacements were brought to us right away. An unexpected but appreciated gesture. Later in the week we found one of the missing ones and losta different one so I think they are getting stuck in the pool table somewhere between the pockets. Thanks for making our stay worry free and relaxing! We enjoyed every minute. 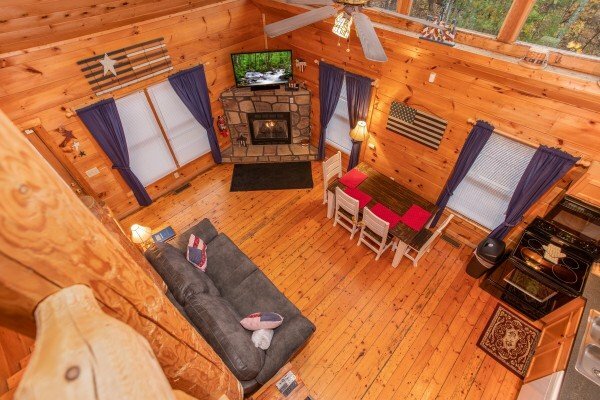 Was our annual trip to Gatlinburg, but first time staying in a cabin. 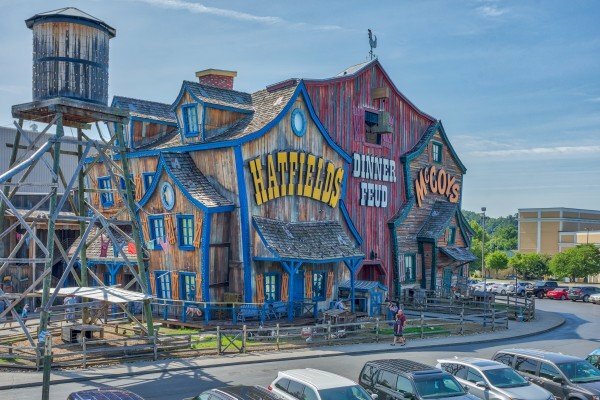 Was an amazing experience have told everyone at work who visits gatlinburg to look up patriot getaways. Thank you for an awesome experience. We had reservations at Denim Blues, the satellite did not get local channels so we could watch the Superbowl. After sending service guy to try to fix the problem, it could not be resolved with satellite company. Matt and James moved us to Patriot Inn. We definitely enjoyed our visit, we watched Superbowl and celebrated our 40th anniversary. We will be staying with you again. Thanks and God Bless. 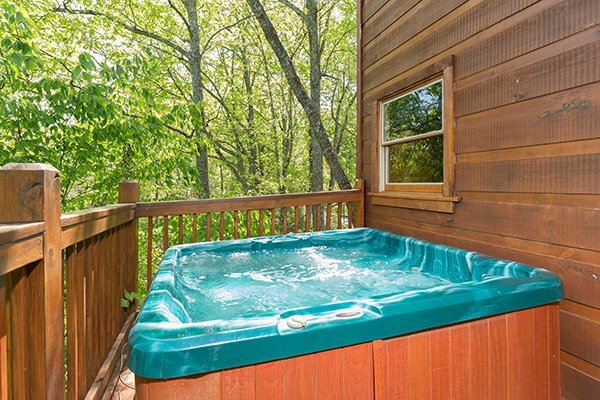 It was a great location to Gatlinburg and the smokeys.......the kitchen was well stocked, the hot tub was very clean...we loved it.